Even with my 25+ years experience in the hair industry, I am still fascinated by current trends of hairstyles, especially when I see an ‘old’ style once forgotten now coming back into vogue. Here are the current trends for the 2018 wedding season. Bows. Bows are a big thing this year – tied and looped onto the hair – they seem to be having the same appeal as a sparkly hair accessories or veil. Slicked back. Tendril, chignons and French twists are taking a back seat this year, with a more edgier slicked-back version instead. With the amount of gel required for this type of style, it means that brides no longer have to worry about stray hairs or frizzing. Low buns. A more casual version of the basic chignon the low bun allows a softer look to this classic design. Bohemian. A trend coming back once again! 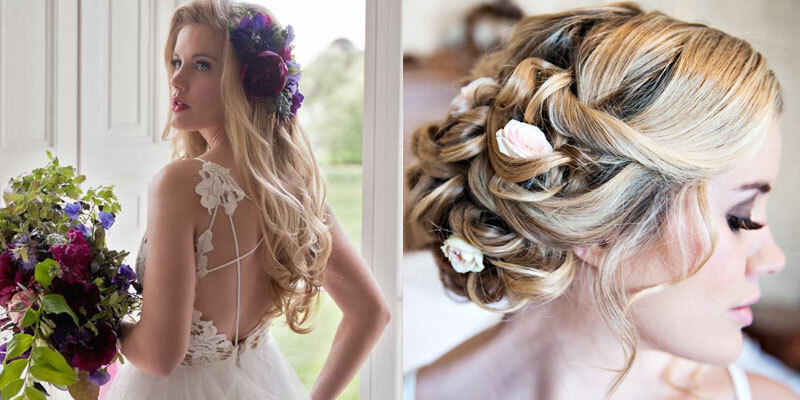 This usually involves fuzzy plaits, loose beach waves and a very lightly placed veil. Orchids. White orchids in hair is BIG this coming season. Usually placed behind the ears or along twisted chignons.